No matter the weather, this Spring Vegetable and Couscous Salad with Feta will have you thinking Spring. Cook couscous according to package instructions. Rinse with cold water and transfer to large bowl. Add chickpeas, zucchini, radishes, almonds, feta and arugula. Mix well. Set aside. In small bowl, combine olive oil, garlic, jalapeño, basil, lemon juice and lemon zest. Whisk until smooth, and season with salt and pepper. 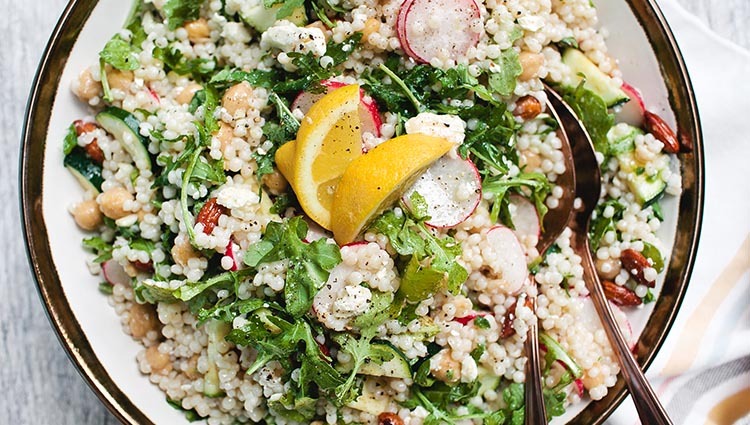 Toss couscous salad with vinaigrette until evenly coated. Serve with lemon wedges, if desired.